Depression. Anxiety. Chronic Pain. Phobias. Obsessive thoughts. The evidence is compelling: the roots of these difficulties may not reside in our immediate life experience or in chemical imbalances in our brains -- but in the lives of our parents, grandparents, and even great-grandparents. The latest scientific research, now making headlines, supports what many have long intuited -- that traumatic experience can be passed down through generations. 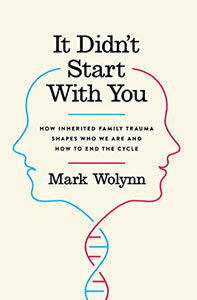 It Didn't Start with You builds on the work of leading experts in post-traumatic stress, including Mount Sinai School of Medicine neuroscientist Rachel Yehuda and psychiatrist Bessel van der Kolk, author of The Body Keeps the Score. Even if the person who suffered the original trauma has died, or the story has been forgotten or silenced, memory and feelings can live on. These emotional legacies are often hidden, encoded in everything from gene expression to everyday language, and they play a far greater role in our emotional and physical health than has ever before been understood.